Did a dumb thing and ran quite a few sets on an old line and my elbow started hurting, its end of season for us and I've been consistently getting well into -38 which is about as good as it gets for me. I took 3 weeks off and tried skiing again because the arm felt ok but it hurt coming out of my 2-4 side - a lot. I could not get down my opening pass(-32) so I decided to switch my grip (to right palm down) and shadowed the buoys for a few passes, perfect no pain. After 4 passes I rounded 6 ball, pass 5 I went outside of 1 and ran a clean pass but overturned 5. Pass 6 was quite easy. So at first it felt odd like I had the wrong foot forward but the last couple of passes felt ok and there might even be some good things going on there, a few more sets and I will report back. Its not perfect but at least I'm skiing without pain. What handle are you using @ozski? Funny because I'm a lefty like you and have always skied with the handle the wrong way (right palm down) and am thinking of switching to the correct way. I don't get elbow problems though so maybe it's been helping me inadvertently?? Masterline ergo handle with a curve in it maybe helps also. What would be the purpose of skiing with a particular grip? Is it more of a comfort or fatigue thing? My brother skies right forward with right palm up and has never had an issue running the course. I've never really thought about it until seeing a couple threads lately. @rockdog I'm using a curved handle and a clincher on my bad arm which I have dumped for the reverse grip test. I posted this thread because as much as anything I think skiing with an old rope was the cause of the issue. I've seen some really good skiers using the so called wrong grip, watch Jeff Rogers for example. I switch up my mixed grip when I deadlift from set to set to avoid elbow tendonitis. Seems reasonable to do it for skiing if it helps. I also agree about ropes; old ropes with zero give are a recipe for pain. @ozski I had a similar situation a couple years ago. I was skiing well with the switched grip, but since the muscles & tendons did not have the benefit of of getting used to this activity all season, I ended up injuring myself. I damaged a nerve that ran from my wrist to my shoulder. Hurt a lot. The only cure was rest. No PT work. Even went to see a neurologist, the answer was the same. And nerves are slow to heal. 18 to 24 months. Good luck and be careful. Your best bet...do not hold on to slack rope. It's just practice. There is probably something going on with your 35 that makes it harder then it needs to be on your body. I'd fix form before masking pain by switching grip or using other devices/equipment. Make 35 smoother. If that means working on things at 32, then do that. Right foot forward should hold the handle like a lefty batter, left foot forward like a righty batter. 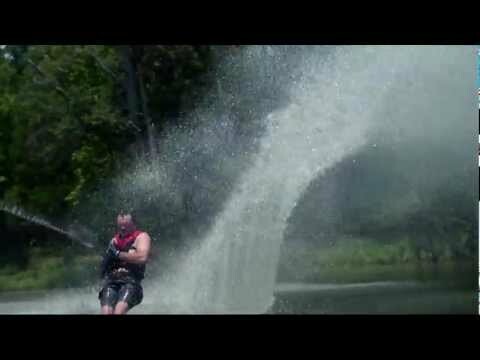 This is better for your pulling position because you can put more power on the water with less effort, it is also more ergonomic in the release/turn. If you are having problems with elbows I would say considering the average age on the site, you may simply not be 20 anymore and need some ice and ibuprofen more often. Beyond that however I would work really hard on your edge change and handle control off of the second wake because that should help you be in the right place at the right speed at the ball so that you turn into tight line rather than slack and are maintaining a easier acceleration/deceleration pattern through the pass. That should help your elbows a lot since they won't be taking the slack hits around the ball. Unless it is for the coveted Big Dawg championship and the $millions in sponsorship endorsements to follow, I gave up trying to hold on to slack hits. It was a hard habit to cure, but my elbows have been much healthier. Thanks guys although I don't think my issues are from taking slack hits rather going back to the same old rope that I was using last time this happened. 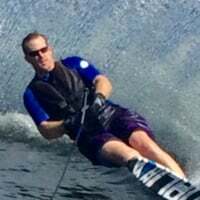 Just staying at -32 and using the reverse grip is working ok for now, running back to back's and working on basics is fine and keeps me on the water..
@ozski, I have a similar elbow situation. I had a radial head fracture in my left elbow in 1990 that gave me fits for a long time. Had it scoped in 2001 for a significant improvement, but somewhere around 10 years ago it was causing major discomfort while skiing regardless of taking hits. Just as an experiment, I switched to a backwards grip and the elbow pain disappeared and I have not had any real problems with that elbow since. I've tried to switch back to "normal" a few times, but the elbow acts up again, and I've quickly gone back to backwards. Its really amazing how small and subtle changes in body alignment affect how the old bag o' bones functions. @Bruce_Butterfield yes I agree and its amazing how different the passes feel skiing with a different grip. I'm not getting much water time right now but I think its only going to take maybe 5 - 10 sets before I have some relative comfort. Its interesting because I'm making sure that I have plenty of space in front of the ball so that I I'm not under any pressure in the turn that might cause me to rush the handle control.